Snow and Sunshine - My 100th post! At last snow has arrived for a stay here.. We have a good amount already and we hope to get more this week. So finally I could take some winter landscapes I wanted for so long. Yesterday we went for a little walk up in the Mecsek with my girlfriend's father to take some pictures, and had the luck to have a beautiful sunshine while we were there, so we could take decent images of the snowy landscape. I loved the shadows on the snow, I couldn't have hoped for better conditions. Not my best lens but for a wide angle that's what I have and I think the polarizer worked well. Adjustments were of the usual type. v�gott, mint egy t�li t�j t�rt�net k�nyveket. Sz�p r�szleteket �s sz�nes kontraszt. What amazing colors of the sky! I liked a lot this colours contrast and the way you compose this one Andor. Great Job! Superb portrait. Very sunny and beautifully, I like the colors, so lovely. tfs. Congratulations for your 100th up-lead on TN. Splendid winter picture, good perspective and depth. Nice composition and good presentation. Congratulations on your 100th posting. And a very beautiful one. Amazing clear colours. The white branches against the blue sky are fantastic. Excellent sharpness and composition. Congradulation for your 100th post.Hope to see a lot more of them.Beautiful landscape and well composed image.Great light and nice colors. Grat nem csak a kiv�l� k�phez, de a 100. felt�lt�shez is. Sz�p jubileum, legszebb k�peid egyik�vel. Csak �gy tov�bb! Congratulation for this 100th post! Great colors to the sky and clouds. Congratulations on reaching your first 100 on TN! 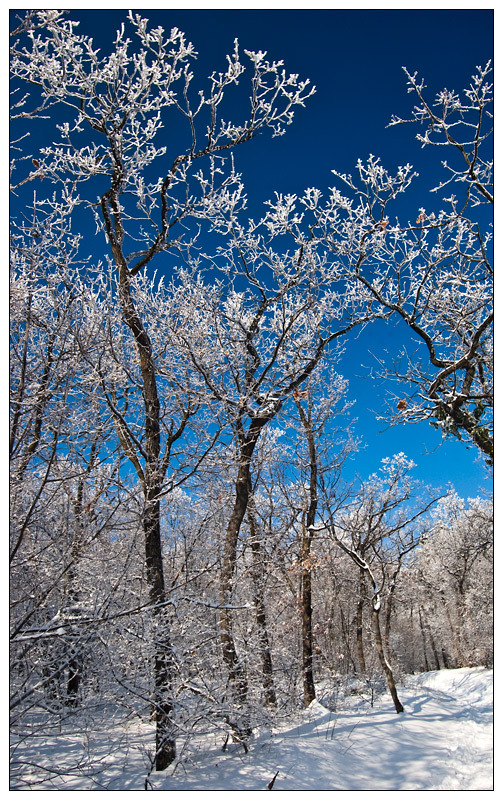 This celebratory winter image shows a fine pattern of frosted branches against an incredibly blue sky! The composition of these young trees standing in the snow is very good too and the lighting adds attraction to the image. Thanks and look forward to seein many more from you! For yours 100 celebration you posted a very nice image.Great colors and clarity of the photo. congratulations on your 100th posting; a fantastic winter landscape, very beautiful contrast of colours, very good sharpness and lighting, well composed. LOve the supperb blue, so bright!! Hi Andor. Congrats on your 100th picture today. You have chossen a beautiful one at that. I like the POV looking up throught the snow lined trees to the deep blue sky. Very good work with the sunlight. TFS. Csod�latos t�li t�jk�p, gratul�lok a sz�zadik fot�hoz a TN-n, sok sz�p fot�t a tov�bbi időszakban is! Congratulations! on your 100th posting on TN! Your photograph gives the taste to leave outside and go to benefit from the winter! Beautiful composition and colors. The sky is of a beautiful blue. Very beautiful final result with the framework. Many congratulations on your 100th posting. This is a very beautiful composition - the icy tips on the trees are lovely. Congratulations on your 100th post. A beautiful scene to celebrate with. The trees, white snow and wonderful blue sky are an unbeatable combination. The picture is so clear and crisp with marvelous colors and sharpness. I'm looking forward to your next 100. Una bella postal. Finos detalles y colores en toda la imagen. Agradable a la vista y un placer disfrutar al apreciarla. Hi Andor and congratulations for your 100th post! The white branches of the trees here - especially in the upper part - look like from a fairy tale and contrast superbly with the deep blue sky. Composition-wise, i think i would have tried to place the road a bit more into the frame, but this is a personal thought. Even so, i like your shot here and i congratulate your for it. Bravo and many more photos on TN!!! Congratulations on your 100th post, Andor! Also thanks for your kind words on my recent picture. This is a wonderful winter landscape. The polarizer filter has lent the image great clarity and has shown a beautiful deep blue sky. Well done and all the best for your next 100! Talk about a strong CP effect. Normally I prefer a more natural looking sky, but with this photo the bold colors and contrast work well. It makes for a kind of semi infrared photo. Beautiful winter image against the saturated blue sky. Very good choice of tall frame with very good management of light and shadow. Congratulations on reaching 100! This is a very beautiful winter landscape and I like the effect of the polarizing filter, it lifts the simple composition a lot. Lovely colours and great sharpness.